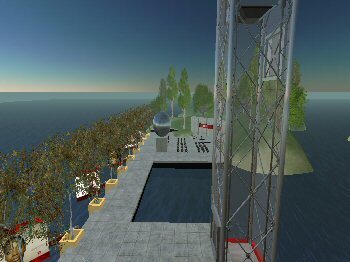 Pleased to announce our project for BBC World in Second Life is now complete and will be open to the public from Saturday October 6th for a limited time. We have had outstanding support from the Singapore agency Avantworks, who threw themselves into the project so hard it hurt. Kudos to principal builder Tracylynne Carpenter, whose playful and stylish build is some of the finest corporate work in the virtual world. Thanks also to my partner Loki Clifton for his insight and dedication. Starting tentatively, the client has grown increasingly enthusiastic about its presence here as they’ve seen the quality of the work and watched the reaction of their staff entering the island. Staff from Europe and Asia have all been chaperoned through the bumpy orientation period. The project involves convincing senior executives from the world’s major advertising institutions to enter the Second Life environment for the first time. Not a trivial undertaking. The objective is to use the medium to develop relationships with these people who have major corporations competing for their attention. The use of Second Life for trade purposes is very sensible. In many ways the medium is not suited to consumer applications. We will also be encouraging the Beeb to use the facility to take advantage of the collaborative opportunities that exist for staff located in different countries. When people have a need to meet regularly the time invested bringing them into the environment is repaid. It’s not complicated. The medium gives people room for self-expression. Not too much of that in a tele-conference.